Wupatki National Monument is located near Flagstaff, Arizona. The monument was founded in 1924 by President Calvin Coolidge, ordered this valuable historical and archaeological site to be preserved, which has left a lasting mark on American history. The boundaries of the monument have expanded several times to date, it extends over an area amounting to over thirty-five thousand acres. The national monument is Wupatki has ruins of the Anasazi Indian civilization and the ancient Pueblo. The name of the monument in the language of the Navajo is the Anasazi Bikin and literally translates as "house of enemies." Hence is derived the name of the Anasazi Indians, who were considered enemies of the Navajo. 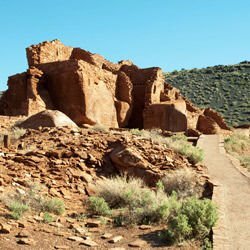 Numerous villages whose ruins are located in different parts of the national monument were built by ancient Pueblo - Indians tribes sinagua, Kayenta Anasazi and Kohonina. The influx of population into this place began shortly after the eruption of Sunset Crater in the eleventh century, which covered the entire valley with volcanic ash. This made the soil fertile in the valley attracted people who wanted to plant their crops here. In addition, volcanic ash increased ability of soil to retain more moisture, which further increased the yield of crops and made it possible for more people to stay in this area. In the twelfth century in this area arrived over two thousand people. They were experienced mostly in agriculture, mostly with pumpkins and corn. Houses that only the walls have survived of today were made of flat red stones, which were cemented with lime solution. Any settlement represents the whole building, which consisted of rooms, and sometimes the number of rooms exceeded ahundred. The most interesting is that the Pueblo Indians built a stadium to play ball. The game of ball was introduced at these places after being taken from Central America and the culture hohokam. Wupatki Stadium is the northernmost stadium built for playing ball games. It is estimated that in 1182 more than a hundred people lived at Wupatki Pueblo, the largest building of fifty miles in the vicinity. Population of several thousand people live in areas of Wupatki, within about a day's journey. Many residents of the area served not only the function of farmers, but also were spiritual leaders and guards. Wupatki legends are spread among various tribes. Members of various Indian clans such as Clan of the sand, the rattlesnake, the gecko, water and snow returned repeatedly to Wupatki to try understand the details of the history of their own clan. The ruins of ancient Pueblo are protected by federal law and their destruction is prohibited. So visitors to the national monument v must tread lightly so that they are away from walls to prevent their destruction. The territory of the national monument Wupatki has not only ancient ruins, but also many plants and animals who should not suffer from the visits of tourists. From the visitor center reaches a trail on which visitors move around without a guide.